Nil Battey Sannata is an incredibly moving and emotional film in parts, and thankfully it’s more than about chasing one’s dreams. Watch Nil Battey Sannata for Swara Bhaskar's acting talent, if nothing else'. It’s a powerful idiom — Nil battey sannata. Those living outside the Hindi belt may not get it. So here’s a quick explanation. Let’s say, it take 100 bricks to build a house. Sita and Gita don’t have a house. Sita has a total of zero bricks, and Gita too has a total of zero bricks. So how many bricks do they have to build a house? Sita and Gita are told that they need 100 bricks to build their house. But neither wants to work to get even a single brick. In fact, they are completely disinclined to even try. That’s sannata. Not just silence, but a disquieting stillness. Battey is the Hindi word for oblique, “/”. So, Nil/Sannata. Na umeed, na umang. Hence, no tarang. 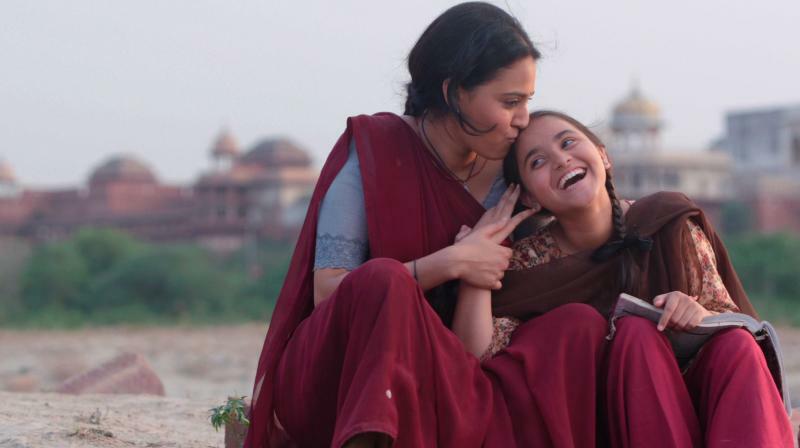 Nil Battey Sannata is the story of Chanda Sahai (Swara Bhaskar) and her daughter Apu, or Apeksha (Ria Shukla). Chanda is a maid, a bai, and her daughter studies in class 10th in a government school. A working, single mother, we see Chanda straddling two very different worlds: She cooks and cleans Mrs Diwan’s house, a doctor whom Chanda calls “Didi” (Ratna Pathak Shah), while Didi is doing sirsasana or gardening, and then there’s the other world, for which Chanda slogs, where she sleeps, dreams, worries and nags. Chanda believes only two things can change one’s life: kismat or mehnat. She’s putting in lots of mehnat, and would like her daughter to pitch in as well. After her work is done at Didi’s house, Chanda works a shift in a shoe factory, a masala godown and even at the dhobi ghat sometimes — to earn as much as she can, to save up for her daughter’s education. She dreams of Apu becoming a doctor, an engineer and, eventually, an IAS officer. But Apu is Nil/Sannata. This nihilistic resignation shakes Chanda to her core. But then her Didi, with whom she shares all her worries, makes a radical suggestion. After initial hesitation, Chanda decides to go ahead with the plan, to shake her daughter out of her complacent, sleepy drift through life. This decision, this plan is a bit too precious, too cute for this real film in a real setting about real people. But, thankfully, it’s done nicely and introduces us not just to Apu’s classmates — Pintu, Sweety and Aman — but also, delightfully, to Guptaji (Pankaj Tripathi). He is the school’s principal and Apu’s Maths teacher. Nil Battey Sannata is an incredibly moving and emotional film in parts, and thankfully it’s more than about chasing one’s dreams. There are small, seemingly casual but very thoughtful touches in the film — clothes, food, chappals, gestures, habits, dialogue and interactions between characters — that don’t just add dimensions to characters, but also embroider their, and our, reality in rather telling detail. For example, the relationship between the mother and daughter. It’s more than just cute bonding. Apu is cussed and can be a real meanie. No different from the lackadaisical and obstinate kids going in AC buses to sit in AC classrooms. Chanda’s fears, desperation too are no different from those of the parents of children throwing tantrums in air-conditioned spaces. But what’s interesting is the layer added to this relationship: that of a single mother and her daughter. The language Chanda uses, the way she abuses her daughter, and the way Apu reacts and talks back to her, establishes that it’s a relationship of equals. The thing about single parents, mothers especially, is that without a third, there takes place a shift in power. Though older, earning, adult, the single, working mother is rendered powerless by her own fears, guilt, responsibility. And is dependant on the child not just to share dreams, frustrations, meals, power outages, but also — emotionally and physically — to succeed, to not be a failure. And that desperation breeds familiarity. And that’s why Apu can be brutal. There’s dependence in Chanda’s other relationship too, with Didi, and lots of sharing, but the difference, distance is maintained. That’s because there is no shift in power. Chanda will always be beholden to her employee. The film captures this beautifully. And that’s partly why we go along with Chanda’s almost too-cute-to-be-real decision. Despite the way in which Chanda challenges her daughter, and the way Apu reacts, it’s clear that Apu still doesn’t have her own dream. But she grabs her mother’s dream, and makes it her own. Nil Battey Sannata is about being locked in a desperate reality together, but then suddenly deciding, midway, to really take the journey together, to walk towards the future with another. Nil Battey Sannata delivers several empowering, powerful messages which are not new (Udaan, Doordarshan 1989, anyone? ), but still important. One message is especially for girls: Maths se dosti kar lo. The other is that that only way to jump several rungs in our hierarchical world is by getting a sarkari naukri. Not just any naukri, but a gazetted one. All this is said through the story till we get to the film’s end where a sermon is delivered which has the stench of Film Division’s preachy, desh aur samaj ka aadhaar sermons to it. Which is strange because the film’s screenplay is written by four people, including the director and it’s rather good. Yet the film shines because of performances. Ria Shukla is very young and yet sharp as a whip. Pankaj Tripathi’s Guptaji is very chamkeela. Not just his lips, his whole personality is pursed. He is absolutely brilliant as the strict teacher who, with his chest out, chin in, motivates and taunts. Tripathi, to my absolute delight, got the pronunciation of a word peculiar to many Maths teachers right: ijekaltu (is equal to). But Nil Battey Sannata belongs to Swara Bhaskar who has till now played motormouth, opinionated, fiery peripheral characters. Here she takes centrestage and holds us — Lo and Behold Messrs Deepika Padukone, Kareena Kapoor and Priyanka Chopra — not with a truckload of costume, hair and make up experts, but the sheer strength of her talent. She is an incredible actress. Watch Nil Battey Sannata for its acting talent, if nothing else.